A Guest Post by Mihaela. This is a unique red and white outfit that you can give to a little girl for her Barbie doll (or other fashion doll) to wear in the summer that any girl will love! The outfit is made in two pieces, a top jacket and a bottom skirt. Feel free to use any two of your favorite colors to make this fun outfit. Repeat round 5 for the other edge of round 4. To join jacket sew on a button or tie tassels. Mihaela lives in Ireland in Waterford and just adores crochet! 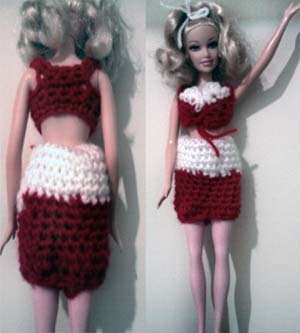 This entry was posted on Saturday, April 14th, 2012 at 12:00 AM by A Guest Writer	and is filed under Free Crochet Patterns. You can follow any responses to this entry through the RSS 2.0 feed. You can skip to the end and leave a response. Pinging is currently not allowed. A nice pattern for a cute summer outfit . Hi Carole, I think it’s a typo in the pattern. Round 4 should be the next round, which was written as round 5. Does this mean that you do a sc in each of the 10 chains to get the 28 sc at the end of this round 5? Yes, you’ll make a sc into all of the stitches, including the 10 chains.